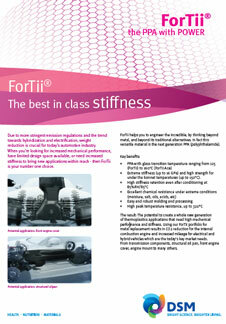 ForTii® Ace JTX8 by DSM is a 30% glass reinforced, polyphthalamide (PPA) grade for E&E applications. 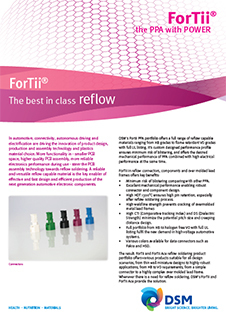 Offers improved resistance to blistering during reflow-soldering process. 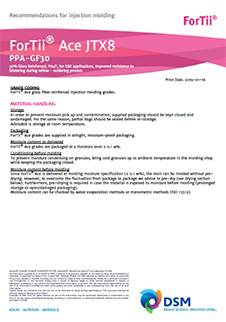 Designed for connectors in automotive and E&E applications. 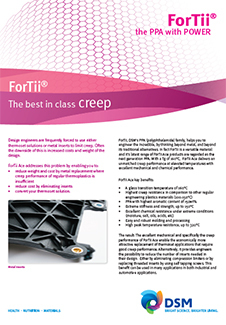 It exhibits high glass transition temperature, high peak temperature resistance upto 320°C and high creep resistance. It can withstand a wide range of chemicals enabling increased durability in various environments (moisture, salt, oils & acids). Possesses extreme stiffness up to 16 GPa and strength upto 150°C. It also provides high stiffness retention even after conditioning at 85%RH/85°C. It is suitable for easy and robust injection molding and processing. 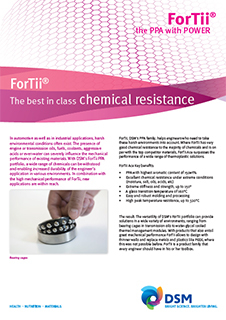 ForTii® Ace JTX8 secures JEDEC MSL 1 (moisture sensitivity level 1) rating. Complies with REACH, RoHS and CONEG.